This class looked at how design is managed within large organisations and the things that managers of design processes, strategies and the design function need to consider. Then, our guest speaker Les Wynn from Xerox, gave us an analytical lecture drawing on his 8+ years with the organisation, during a transition from a technology-led manufacturer of photocopies, to a market-led supplier of services. Hearing this detailed account of the change in the role of design and and how design is managed raised several questions similar to the Virgin case. A think-and-make-tank for Soul of Africa: MBA students collaborate with designers from Lucy Kimbell on Vimeo. Over one day, the MBAs and designers used visual methods to frame and tackle problems facing the organisation. Soul of Africa employs women to make shoes which are sold around the world, while a percentage of the profits goes back to help communities in South Africa affected by AIDS. Mixed teams worked on strategy, operations, marketing and design combining creative and analytical approaches to generate recommendations for Soul of Africa. This short film gives an overview of what happened on the day. The MBA students then carried on working on the project as part of their assessed work. Their documents were shared with Soul of Africa, who may take some of the ideas forward. Organised as part of the MBA Design Leadership elective, Said Business School, University of Oxford in April 2009. At last week's European Academy of Management in Liverpool, a gathering of organisation and management academics mostly but not only from Europe, I was delighted to spend time with some scholars paying serious attention to questions of designing and it relation to managing. The track on Design Thinking, Management and Innovation was co-chaired by Armand Hatchuel, from Ecole des Mines and Rachel Cooper, Lancaster. Hatchuel and Weil's C-K (Concept Knowledge) theory is an important contribution to the study of management, via engineering design theory, and formal logic. Not that this was being presented at EURAM on this occasion...Hatchuel's chairing encouraged speakers and those listening or asking questions to take seriously the claims we were making, whether rooted in economics, sociology or by way of Foucault. (written in pseudo citation format for any readers searching for references). I was left with a sense that the work being done in North America by Boland and Collopy, and by Roger Martin, and others, is in an important dialogue with these ideas, whether they are familiar with these scholars or not. Starkey, K.; Hatchuel, A.; Tempest, S. 2009. "Management research and the new logics of discovery and engagement", Journal of Management Studies, 46 (3), pp. 547 -558. Ahead of my visit to Liverpool next week (and Tate Liverpool and, even better, FACT...) here is my paper I'm giving at the European Academy of Management (see . I've already had loads of useful criticism including from journal editors (within management/org studies). I'm posting it here in the expectation of reworking the paper after EURAM and welcome other feedback from readers. Management and organization scholars interested in design typically draw on Simon’s (1969/1996) distinction between science and design. Scholars, educators and practitioners proposing that managers adopt “design thinking” often describe the practices of professional designers, but neglect the studies of designers’ activities in design studies. For its part, that tradition has paid little attention to the practice turn in contemporary social theory and the role of non-designers in constituting designs during consumption. This paper contributes to discussions about the value of the ways designers do things by using the practice perspective to attend to what constitutes design practice. Drawing together these traditions – studies of what designers do within design studies, and practice theory within organization studies – a pair of concepts is proposed: “design-as-practice” and “designs-in-practice”. Using this pair offers a way to move beyond discussions of individual designers and acknowledge the work done by others in constituting designs. 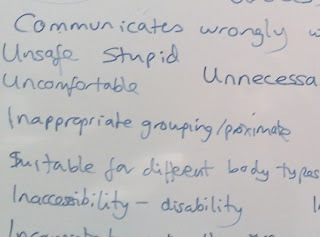 In this class we undertook a “crit” (critique) of design at Said Business School and began to generate a vocabulary for talking about the success or failure of design outcomes. I asked MBAs to identify two examples of ‘good’ design at SBS and two examples of ‘bad’ design based on their own criteria, and bring them to class. Examples included service and process design, product and furniture design, web/interface design, graphic and communication design, interior design and architecture. Through this discussion of what makes good or bad design we attended to the practices of people who uses the outcomes of design processes, whether they have been designed by professional designers or not - designs-in-practice. Our discussion of criteria for good and bad design drew on different ways of making judgements about design such as Vitruvius: firmness, commodity and delight; Sanders (1992): useful, usable and desirable; and IDEO's framework of desirable, feasible and viable. Our second activity was to write briefs based on these criteria for design improvements in the school. 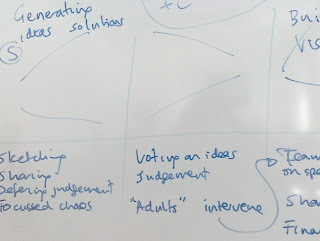 Students took one of the issues they had identified, mapped the stakeholders connected to this issue, prioritised one, and then defined criteria from that point of view for a re-design. After the 'think and make tank' collaborative workshop with designers the previous week, this session offered the MBAs a chance to consider and discuss what is distinctive about what designers do, how they do it, and the sorts of artefact they create along the way – what is sometimes called “design thinking” or “designerly ways of knowing”. Studying the research into designers’ work demystifies the creative design process and offer students insights about what to expect when products and services are designed by or with professional designers. But the term “design thinking” has limitations – although people using it may claim to be user-centred, it nonetheless privileges the designer as the key agent in design, ignoring decades of work in anthropology and sociology. Introducing the terms “design-as-practice” and “designs-in-practice”, the elective offers students a way to understand that design is not just about what designers do (or how they think), but also about what stakeholders, users and artefacts themselves do in constituting design. In this class we watched the well-known ABC TV segment in which the product design and innovation consultancy IDEO re-designs a shopping cart in just five days. A second viewing gave students a chance to analyze in detail the process the designers use to come up with their innovative re-design and identify when there was divergent and convergent thinking and use of methods such as ethnographically-inspired research, visualisation, brainstorming, and prototyping. Attending to the design or management of the process was identified as an important skill.